OMG. This dish is perfect for a fall or winter dinner! It’s hearty and filling but healthy, and SO good. You don’t need much to fill up! 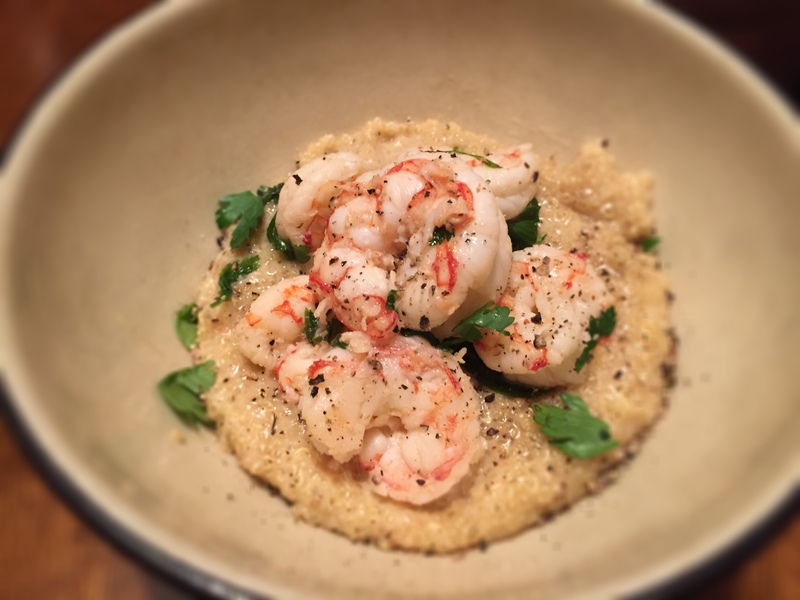 A client and friend posted a version of shrimp and “grits” on her Instagram, and I just had to know more…GRITS?!! Healthy grits??! She explained that the “grits” were actually quinoa… Brilliant!! I then went on a mission to find a recipe and create this amazing dish. .. It just so happens that my friend Kim Hughes and I needed a proper catch up annnnnd she asked me to make her dinner, which I jumped on, because I love to cook for people!!! I found a recipe on From the Little Yellow Kitchen and it was perfection. I used a mix of 3 blend cheese from Trader Joes and just added as much as needed to make the consistency right. Add water or broth and quinoa to a pot and bring it to a boil. Reduce heat, cover and simmer for about 15 minutes. Remove from heat and stir in the cheese and milk. Add a little salt and pepper to taste if wanted. Season shrimp with salt and pepper. Add olive oil and shrimp to a pan and cook until shrimp for 3-4 minutes, until shrimp are just slightly pink. Add lemon juice, parsley, and garlic and sauté for 3 more minutes. Put shrimp mixture onto a separate plate. Add chopped spinach and chard leaves to the pan and sauté 3-4 minutes, or until wilted. Serve chard and shrimp mixture on top of the cheesy quinoa. Enjoy!